The old site was created a few years ago and was in need of a design refresh, a find-your-local-optometrist search and a complete assurance that it would work well across all devices, including mobiles and tablet computers. We set to work, designing a bright and accessible layout with new iconography to guide navigation and a vastly improved menu structure to make browsing a breeze. 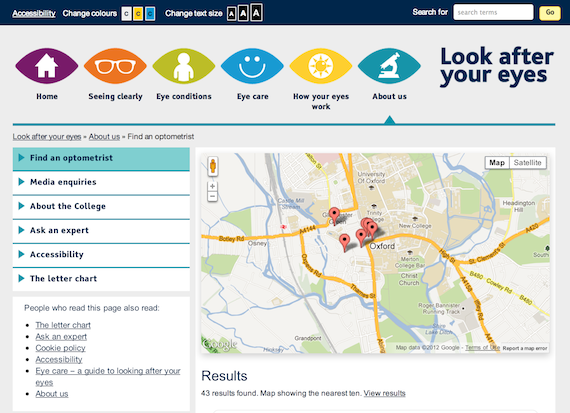 We added a postcode search which interrogates the College member database and finds you your local optometrist by plotting their location on a map. The search allows people to filter by a range of criteria including distance, gender and language spoken. Any site whose audience includes people with visual impairments needs to take heed of accessibility standards, so we made sure the site was WCAG 2.0 compliant and we tested it with people who have a range of different eye conditions. Nothing beats asking your target audience to make sure! Really delighted with the work we’ve had from Minervation: they’ve bent over backwards to meet our needs and that of our audience, and been a pleasure to work with. It’s rare to find a truly expert supplier who can self-direct, but they’ve made every step of this project incredibly easy for me, and I can’t recommend them highly enough. The site has recently been awarded the Plain English Campaign Internet Crystal Mark, which is a rarity for health websites. You can read more about this in the College press release, which marks Plain English Day (14th Dec 2012).